In this post, we blog about the capture and storage of CO2 in deep geological formations, one of the proposed solutions to reduce CO2 emissions to the atmosphere. CO2 is injected as a supercritical fluid deep below a confining geological formation that prevents its return to the atmosphere. Multiphase flow simulations have been performed by Amphos 21 in the framework of the European project CARBFIX. 1) Structural trapping of free-phase CO2 in geological traps. 2) Capillary trapping of small bubbles of CO2 gas that are retained in the porous space by capillary forces. 3) Trapping by CO2 dissolution into the resident brine. Mineral trapping by precipitation of carbonated minerals into the porous space. This is a multiphysics and multiscale problem. For that reason, we opted for Comsol Multiphysics (www.comsol.com) to build up a multiphase transport model that considers miscibility between CO2 and the native brine. Structural, capillarity and dissolution process are taken into account. The injected CO2 gas forms a bubble that moves upwards and accumulates under the anticline caprock. While the CO2 plume moves, small bubbles of CO2 gas are retained in the porous space by capillary forces at the tail of the CO2 plume. At the CO2/brine interface, CO2 slowly dissolves into the resident brine. The CO2-enriched brine is denser than the resident water and tends to sink leading to the formation of gravity fingers. 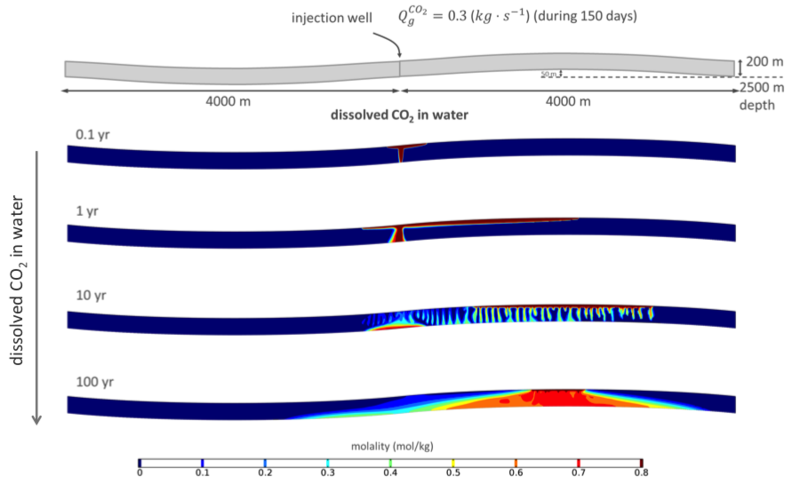 The resulting convective flow facilitates a faster dissolution of CO2 bubble. With the numerical model we can assess the storage capacity of the anticline/syncline system by quantifying the mass of CO2 captured for the different mechanisms and its temporal evolution. Temporal evolution of the computed contribution (%) of the three considered trapping mechanisms. Just changing the location of the injection well affects the contribution of the different trapping mechanisms. 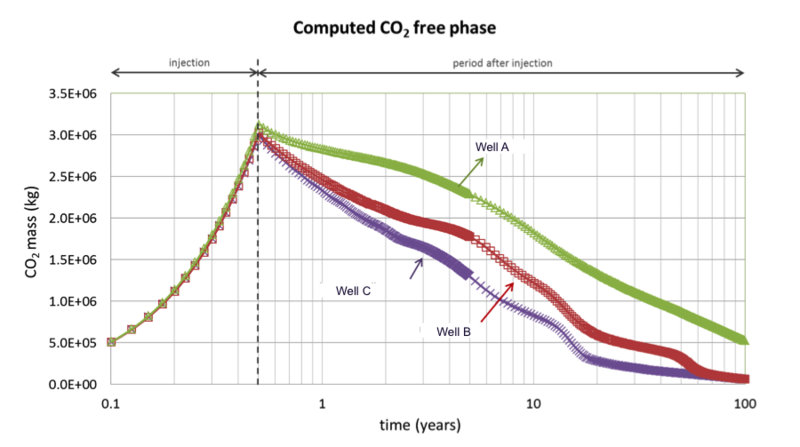 For example, in Figure 3, we see how the free-phase CO2 diminishes faster for a well located at the syncline (well C). 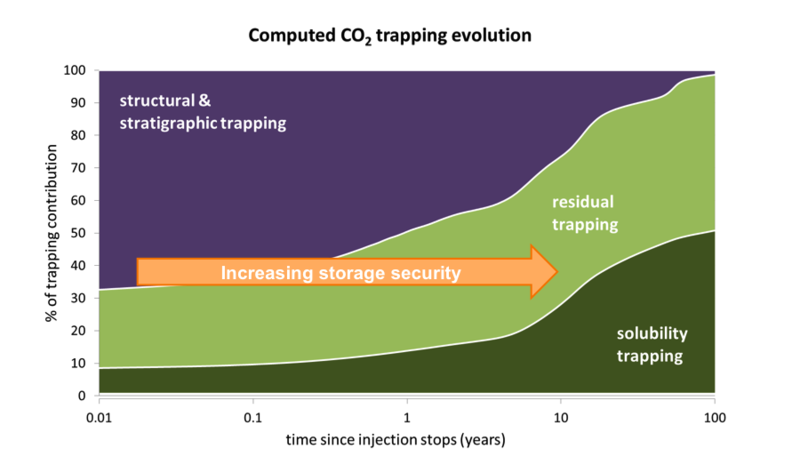 In that case, the longer CO2 footprint results in a more efficient capillary and dissolution trapping increasing the storage security. Temporal evolution of the free-phase CO2 for three different well locations: Well A located at the anticline axis, Well B located between the anticline and the syncline and Well C located at the right syncline flank. 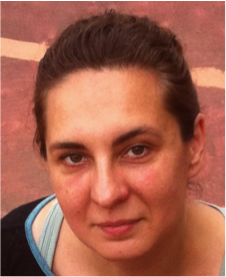 Elena is Project Manager at AMPHOS 21 (www.amphos21.com). She is in charge of several modeling projects involving reactive transport simulations related with both nuclear waste repositories and deep injection of CO2. She holds a PhD in Hydrogeology by UPC – Barcelona Tech. Before joining Amphos 21, she was a Post-Doctoral Research Associate at the Auburn University (US) and the Massachusetts Institute of Technology (US). This work has been funded by the 7FP EC project CarbFix and has been conducted at Amphos 21 in collaboration with Albert Nardi and Fidel Grandia. Their contributions are gratefully acknowledged.